The first curly arrows…lead to this? Origins of the Regioselectivity of Cyclopropylcarbinyl Ring Opening Reactions. Twenty years are acknowledged to be a long time in Internet/Web terms. In the early days (in 1994), it was a taken that the passage of 1 Web day in the Internet time-warp was ~≡ 7 for the rest of the world (the same factor as applied to the lives of canines). This temporal warping can also be said to apply to computational chemistry. I previously revisited some computational work done in 1992, and here I rediscover another investigation from that year and that era. The aim in this post is to compare not only how the presentation of the results has changed, but how the computational models have as well. Semi-empirical methods such as PM3 (ab initio methods were used only sparingly). 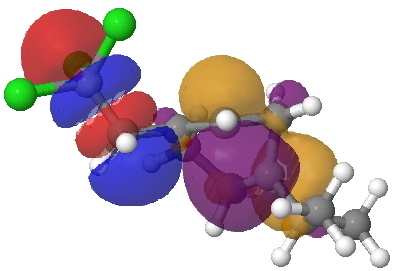 Simulations were often for the gas phase only (although the self-consistent-reaction-field was starting to be used to simulate solution). 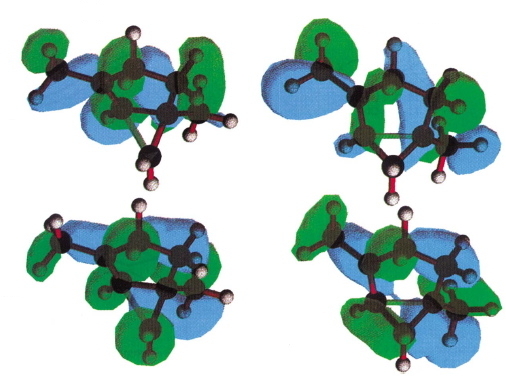 The conclusion in 1992 using these techniques found that the transition state for 5-exo ring formation was 3.1 kcal/mol higher than for 6-endo, contrary to the experimental result. With no support from mere activation energies, perhaps slightly desperate recourse was made to an orbital correlation diagram, and the discussion included, inter alia, an arcane feature involving an avoided orbital crossing unique to the 5-exo transition state. Perhaps, in retrospect, rather too arcane for the intended audience, since this is unfortunately not a well cited article. How might one do things differently (better?) twenty years on? Here, I start with presenting a (3D) model of each transition state. This was not done in 1992 for reasons of space (the journal format limited the page length very strictly) and of course the journal was only available in printed form (no e-journals then!). The model itself can be greatly improved (ωB97XD/6-311G(d,p)/CPCM=CCl4). We now have a DFT calculation, including proper dispersion terms (which PM3 lacks by the way) and good triple-ζ basis set (PM3 is single-ζ), with inclusion of solvation (even though this is a radical, the dipole moments are nevertheless in the range 3-4D, and hence a gas phase model may not be entirely appropriate) and with no trimming off of groups. Crucially (in retrospect), my decision to delete the CCl3 group in 1992 was not a sound one! We have no archive from those days however, so cannot double-check this point. The modern calculation is indeed archived here (although of course whether this archive will itself still be available in 20 years time remains to be established!). The presentation of this model can also be improved from that available 20 years ago. As usual, just click on the image above to see it. The free energy of activation, ΔG†298 = 10.6 kcal/mol, is an entirely reasonable value for radical ring opening of a cyclopropyl (this value is mysteriously not reported in the 1992 version, for which I also take complete blame). 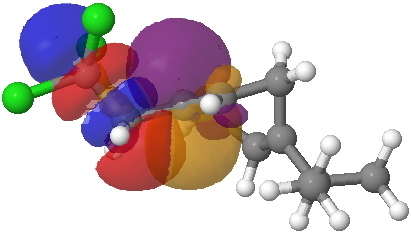 The isomeric 6-endo transition state (which is observed to be kinetically slower) indeed now has the higher calculated barrier (ΔG†298 = 11.5 kcal/mol) and this value corresponds to a process about 5 times slower than 5-exo. Recollect, PM3 obtained the opposite result, but possibly that was because the CCl3 group was not present in the model. We can learn a little about the dynamics of the reaction path; note how the isopropyl group rotates near the end of the ring-opening, due to some form of σ-conjugation no doubt. Instead of delocalised molecular orbitals, we are going to present localized NBOs, and in particular look at the localised effect to the C-CCl3 bond. The orbitals for the 5-exo transition state are shown first. The red-blue is the C-CCl3 σ* NBO orbital, the purple-orange is the highest energy doubly occupied NBO orbital (these two are selected because they represent a pair with a small energy gap, which means a larger interaction energy). Where blue and purple, or orange and red overlap, we have a stabilizing influence. The equivalent pair of NBOs for the 6-endo transition state overlaps much less well (click on image to get a rotatable 3D model to see for yourself). Nevertheless, the 6-endo transition state manages an overlap between the highest singly occupied NBO and the C-Cl σ*, but because it involves only one, and not a pair of electrons, the stabilizing effect is smaller. What we conclude is that at the transition state, the 5-exo isomer has the more stabilizing orbital overlaps, but that beyond the transition state, the greater thermodynamic stability of the 6-endo isomer takes over. Well, here we have a refresh of some chemistry analysed 20 years ago, and done with the help of software and hardware tools that have advanced considerably during this period. One may only speculate what another refresh in 20 years time might bring! This entry was posted on Friday, July 20th, 2012 at 1:55 pm and is filed under Uncategorized. You can follow any responses to this entry through the RSS 2.0 feed. You can leave a response, or trackback from your own site. Origins of the Regioselectivity of Cyclopropylcarbinyl Ring Opening Reactions. is licensed by Henry Rzepa under a Creative Commons Attribution-Noncommercial-Share Alike 3.0 United States License.